Taiwan has had close relations with the United States since 1949, as a strategic asset of Washington foreign policy and Pentagon military planning. In more recent times its strategic importance has increased with US attempts to counter the rise of China in the Asia-Pacific region and elsewhere. Recent US initiatives toward Taiwan have, therefore, been a useful indicator of the rising tide of US militarism. Other initiatives, at the behest of the US, also reveal a political campaign of unofficial diplomatic activity being launched from Taipei into the wider region to serve 'US interests'. Diplomatic relations between the US and China’s unliberated Taiwan Province were established out of circumstance and Cold War positions. In December 1949, following the victory of forces led by Mao in China, the US moved their embassy from Beijing to Taipei in neighbouring Taiwan. Later, with the beginning of the Korean War, the US resumed aid to Taiwan and moved their 7th Fleet into the area to prevent Taiwan’s liberation by the PLA. For the later thirty years, US imperialism had close diplomatic relations with Taipei. In 1979, however, the US broke diplomatic relations with Taipei to begin normal relations with Beijing under guidelines of the One China policy. Taiwan, however, continued to form part of a close working relationship with both Washington and the Pentagon. The US used an ambiguous definition of the One China policy to enable 'close unofficial relations with Taiwan'. (1) The close relations have now been boosted by the Trump administration in Washington which seeks to counter the rise of China with classic new Cold War positions. The US recently opened a new American Institute in Taiwan (AIT), for example, modelled on usual diplomatic missions with nearly five hundred diplomatic staff on temporary leave from the State Department. (4) Official media releases about the opening of the AIT facilities also included reference to the 'de facto US Ambassador Kin Moy', who addressed President Tsai Ing-wen with the statement, 'I offer you this building, a tangible symbol that the US is here to stay'. (5) The Trump administration then approved US$1.4 billion in arms sales to Taiwan. The Pentagon for some years been 'particularly concerned about the growing imbalance of power across the Taiwan Strait'. (6) The rapid rise of China has been regarded by the US as a threat to traditional hegemonic positions. In response, the US imperialists have sought to encircle and contain Chinese influence both in the region and elsewhere. The recent developments in Taiwan are particularly interesting when studied in the context of full implementation of Pentagon planning from the previous period of Defence Secretary Donald Rumsfeld with the Global Transformation of Defence and Security (GTDS). The military planning included Japan being transformed from a client state to fully-fledged regional hub for northern 'US interests' with Australia as a southern counterpart. Other countries within the close proximity of the two hubs were subsequently linked through Tokyo and Canberra to coordinate regional defence and security provision through a vast matrix of various component parts. The two main hubs were also closely linked to the Pentagon in a real-time triangular relationship to formalise US control of regional foreign policy. Historically, most US foreign intelligence was conducted by the CIA, not the DIA From numerous declassified documents it is possible to identify those targeted and the methods of intelligence collection. The US Army Foreign Intelligence Assistance Program, for example, specialised in the coordinated counter-intelligence activities worldwide against 'those who oppose the US Defence Department, during peacetime and all levels of conflict'. (11) The standard method of operation was through the official channels of the host country including the Police, and infiltration of agents into as many organisations as practically possible. The recruitment of agents, however, was to later raise serious considerations for the US. Following the collapse of the former Soviet Union and the US-led so-called New World Order the US intelligences services purged itself of many agents who proved an embarrassment. Criminals, for example, had in some cases been recruited, together with others having 'sordid records'. It was eventually acknowledged the 'CIA seemed to specialise in hiring murderous thugs and military officers'. (12) Many of those dismissed were later regarded as incompetent and questions were raised about the actual value of the intelligence they had provided, with official reference to 'an ethical vacuum' and the 'bad habits of the Cold War'. (13) The type of intelligence those agents collected was from a civilian population and used to establish profiles and assessments. With Taiwan so close to China there would appear little ambiguity about the role of the US and their GTDS system; about 50,000 US troops are based in nearby Japan 'under a security treaty alliance'. (18) The US-led initiatives toward Taiwan, therefore, provide further evidence of the wave of militarism sweeping across the Asia-Pacific region. The US are preparing for real-war scenarios in the Asia-Pacific region. 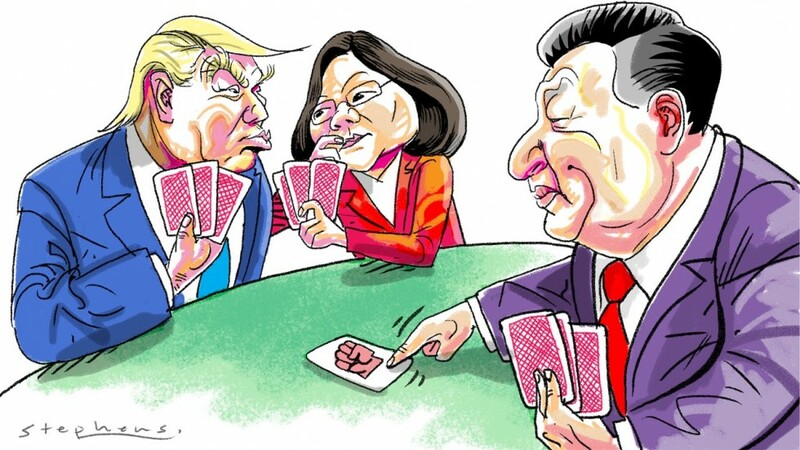 US foreign policy initiatives toward Taiwan appear oblivious to the fact that only eighteen countries now recognise Taipei as an independent entity for official diplomacy; the vast majority of countries at United Nations level accept the One China policy and recognise Beijing. Taiwanese government international relations policies and unofficial diplomacy have therefore raised controversy as an attempt to undermine traditional and accepted norms of diplomacy. What the real reason, therefore, for a low-key visit to Canberra by Prime Minister Rick Houenipwela of the Solomon Islands mid-June where a high-level diplomatic meeting took place with PM Malcolm Turnbull, has not been officially clarified. (22) The timing, however, is significant. The Solomon Islands forms a strategic part of the Defence of Australia military plan and is also one of the six countries in the region with diplomatic links with Taipei as opposed to Beijing. The sooner ordinary, sensible working people get rid of these war-mongering clowns and formulate an independent Australian foreign policy, the better! 1. Beijing keeps a wary eye on new US Taipei outpost, Australian, 18 June 2018. 2. US signals foreign policy shift away from military might, Guardian Weekly (U.K.), 6 June 2014. 3. Ibid., and, US eyes return to south-east Asian bases, Guardian Weekly (U.K.), 29 June 2012; and, US signs defence deal in Asia, Guardian Weekly (U.K.), 2 May 2014. 4. Australian, op.cit., 18 June 2018. 6. U.S. Seeks New Asia Defences, Wall Street Journal, Friday-Sunday, 24-26 August 2012. 7. Japan to extend military reach beyond self-defence, Age (Melbourne), 29 April 2015. 8. Australian, op.cit., 18 June 2018. 9. Pentagon plays the spy game, Guardian Weekly (U.K.), 7 December 2012. 11. Website: Army Foreign Intelligence Assistance Program, Army Regulation 381-20, Part 1.5, Mission and Policy, page 1. 12. The CIA cleanses itself, New York Times, 4 March 1997. 14. US army gets grip again on jungle warfare, Weekend Australian, 18-19 March 2017. 15. Guardian Weekly, op.cit., 7 December 2012. 18. Japan unifies army for first time since WW2 to counter China, Australian, 6 April 2018. 19. Chinese flex naval muscle off Taiwan, Australian, 19 April 2018. 20. Australian, op.cit., 18 June 2018. 22. Pacific pressured to cut ties with Taiwan, Australian, 14 June 2018. 23. Australian, op.cit., 18 June 2018. 26. The Pentagon's Indo-Pacific Command, Sputnik News, 8 June 2018. 27. Website: Your Military, Indo-PACOM. 28. In symbolic nod to India, Reuters, 31 May 2018. 29. Key intel role for China hawk, Australian, 15 June 2018.